"Europa wird direkt ins Herz getroffen"
"Es ist gewiss unüblich, dass weit mehr als ein Zehntel der Abgeordneten das Parlament, in das sie gewählt worden sind, abschaffen oder in seinen Rechten beschneiden wollen. Aber diese Anomalie spiegelt nur den Umstand, dass wir uns noch mitten in einem umstrittenen Prozess der Verfassungsentwicklung befinden. Ich finde es gut, dass die Europagegner ein Forum gefunden haben, auf dem sie den politischen Eliten die Notwendigkeit vor Augen führen, die Bevölkerungen selbst endlich in den Einigungsprozess einzubeziehen. Der Rechtspopulismus erzwingt die Umstellung vom bisherigen Elitemodus auf die Beteiligung der Bürger. Das kann dem europäischen Parlament und seinem Einfluss auf die europäische Gesetzgebung nur guttun. Anders verhält es sich mit den Auswirkungen auf die nationalen Szenen in den Mitgliedstaaten. Hier mag in einigen Ländern die Gefahr entstehen, dass sich politische Parteien einschüchtern lassen und auf einen Anpassungskurs à la CSU umschwenken." * Christian Thomas - "Die Souveränität ist nicht erkennbar"
* Werner Mussler - "Europas Herz schlägt anderswo"
See also Timothy Garton Ash's article "Europe: the continent for every type of unhappy" (The Guardian, May 26, 2014). Constitutionalism offers a governance order a set of normative values including, amongst others, the rule of law, divisions of power and democratic legitimacy. These normative values regulate the relationship between constituent and constituted power holders. Such normative constitutional legal orders are commonplace in domestic systems but the global constitutionalisation debate seeks to identify a constitutional narrative beyond the state. 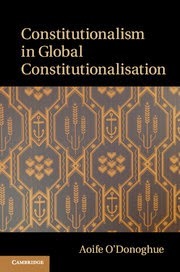 This book considers the manner in which the global constitutionalisation debate has neglected constitutionalism within its proposals. It examines the role normative constitutionalism plays within a constitutionalisation process, and considers the use of community at both the domestic and global governance levels to identify the holders of constituent and constituted power within a constitutional order. In doing so this analysis offers an alternative narrative for global constitutionalisation based within normative constitutionalism. 7. Who Does Global Constitutionalism Address? Aoife O'Donoghue is a senior lecturer at Durham Law School, Durham University. On 11 September, Jürgen Habermas delivers a lecture on "Democracy in Europe" at the University of Stavanger, Norway. His lecture is part of a two-day symposium on Habermas's theory of democracy. Other participants are: Erik Oddvar Eriksen (Oslo), Anders Molander (Oslo/Akershus), and Cathrine Holst (Oslo). Elizabeth Anderson talks about the history of egalitarianism, John Rawls, and luck versus relational egalitarianism. Elizabeth Anderson is Professor of Philosophy and Women's Studies at University of Michigan. She is the author of "The Imperative of Integration" (Princeton University Press, 2010). See a chapter from the book here [pdf]. 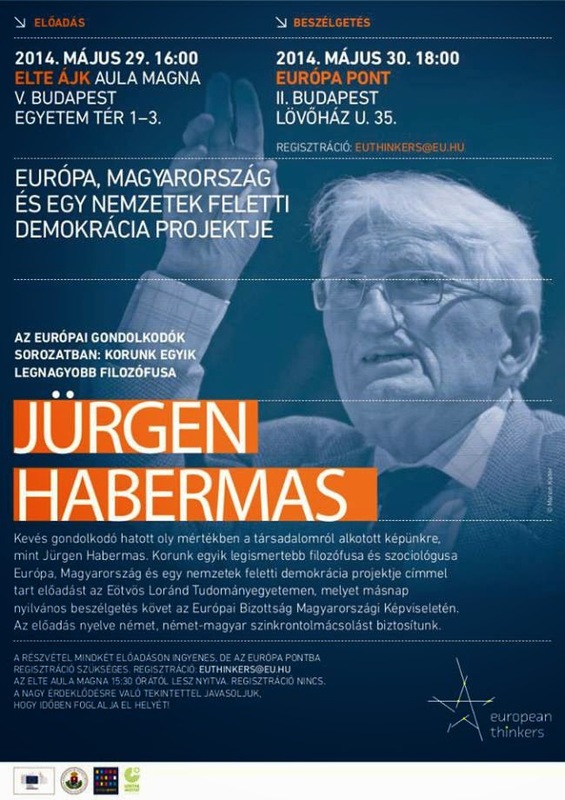 Jürgen Habermas is speaking in Budapest on May 29 and May 30, 2014. And a report in "Wiener Zeitung" here. 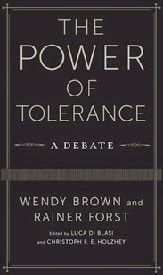 Wendy Brown and Rainer Forst debate the uses and misuses of tolerance, an exchange that highlights the fundamental differences in their critical practice despite a number of political similarities. Both scholars address the normative premises, limits, and political implications of various conceptions of tolerance. Brown offers a genealogical critique of contemporary discourses on tolerance in Western liberal societies, focusing on their inherent ties to colonialism and imperialism, and Forst reconstructs an intellectual history of tolerance that attempts to redeem its political virtue in democratic societies. Brown and Forst work from different perspectives and traditions, yet they each remain wary of the subjection and abnegation embodied in toleration discourses, among other issues. Wendy Brown is Professor of Political Science at the University of California, Berkeley. She is the author of "Regulating Aversion: Tolerance in the Age of Empire and Identity" (Princeton University Press, 2006). Rainer Forst is Professor of Political Theory and Philosophy at Goethe University, Frankfurt am Main. His recent books include "The Right to Justification" (Columbia University Press, 2011), "Toleration in Conflict" (Cambridge University Press, 2013) and "Justification and Critique" (Polity Press, 2013). The book is based on a discussion in Berlin in 2008. * Discussion: part 1, part 2, part 3. A German edition of the book has been published by Turia-Kant Verlag. Professor Axel Honneth (Frankfurt/Columbia) is giving a lecture at the University of Oxford on "The Idea of Social Freedom" on May 5. On May 6-7, the Senate House (University of London) is hosting a symposium on critical theory - "The Right to Freedom". The speakers are: Axel Honneth (Frankfurt/Columbia), Lois McNay (Oxford), David McNeill (Essex), Jörg Schaub (Essex), Timo Jütten (Essex), and Michael Rosen (Harvard). The symposium is free but requires registration. The symposium is jointly organised and funded by the Faculty of Philosophy, University of Oxford; the Department of Philosophy, The Open University; and the School of Philosophy and Art History, University of Essex.